After being so much time in some dark tech worlds and cold winter or lifeless environments, I hope Kylo takes some SPF to that desert. No, but seriously, it must be something for him to finally be out of that lifeless and dark or cold trap where he had been for such a long time. 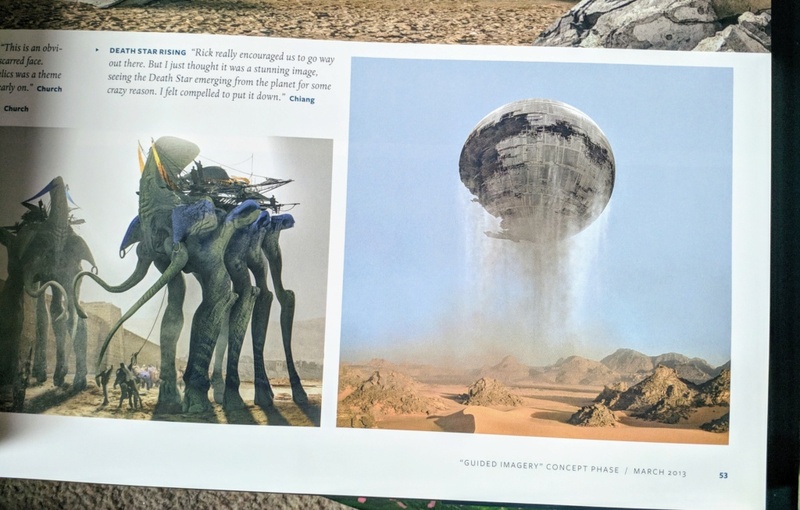 Apparently those were the concept art pieces being referred to. @special_cases The first gif of Rey is straight up her "you have that look in your eyes from the forest." Which is her jaw wobbling for a second because it's him and then setting it because she has to toughen up. She also does it when she sees him in the last Force Bond and then slams the door in his face. 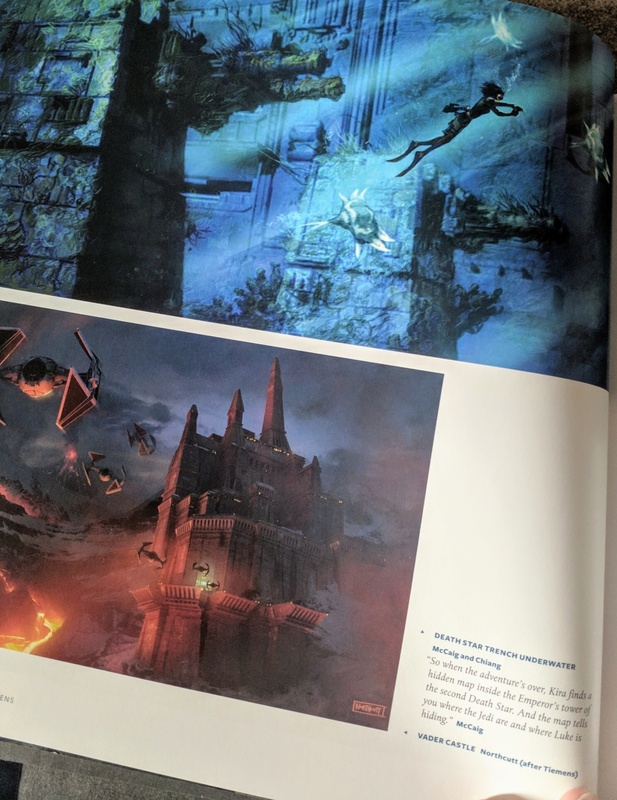 Since Rey may end up on Kylo cockpit and use her lighsaber, I was wondering if maybe they will use this concept art of TFA for the movie. Pablo is saying that he found out about the title the same time everyone else did. I only noticed it, but the letters of the title 'rise' when they appear. For a comparison, the letters of TFA turn and the letters of TLJ just appear. Well spotted ! I saw someone on Tumblr (sorry I forgot to take a screenshot) say they noticed there seemed to be less stars behind TROS titles. It looks that way but I can’t be certain tbh. You're right, there are less stars. However, it's the same starry sky for the three titles. In TFA, all the stars are present. In TLJ, at first it's like TRoS, then more stars appear, and finally it is similar to TFA. @LadyGaufrette Excellent catch. My guess would be it's also acknowleding the end of the 9 film cycle by starting with the title/logo for the original one. Hi guys, I had an illumination. I don't know where to put my thoughts but this is a point of general discussion and so I'll put it here. I was waiting for the title to be translated into Italian and French. Well now I've seen it with my own eyes: Ascension. The same meaning is used in French. I went to look for the meaning of the word. I've always noticed that names and surnames in Star Wars often have more than one meaning. In other parts of the forum, I mentioned that in SW I always saw references to the New Age philosophy and the Gnostic myth. The Gnostic myth that I saw, however, is not pure, it has always seemed to me a nice mixture of Christian and Eastern Gnosticism. Let's go back to the word: Ascension. Here in the vocabulary this word has 3 meanings. 1) The most famous is religious, linked to death and resurrection of Jesus. My first idea was therefore Ben Solo will sacrifice himself and die for "Ascend to heaven" having accomplished his saving mission. This part also coincides with my Gnostic idea. But what hope would there be for Rey who has always lived alone waiting for someone? Note that the meaning of "Ascension" is also known in Islam. The prophet also ascended into heaven, knew Moses and Jesus, and finally Allah and then "went back down" to earth. 2) The second meaning refers to an ascent like an elevation, a climb, and can be used to indicate a mountaineer who climbs a mountain. 3) The third meaning is astronomical. The right ascension of a planet is the angular distance between the point of intersection between the celestial equator and the ecliptic corresponding to the spring equinox. It is a very interesting phenomenon if this point in the cosmos must represent the meeting point between two planets in the same orbit. 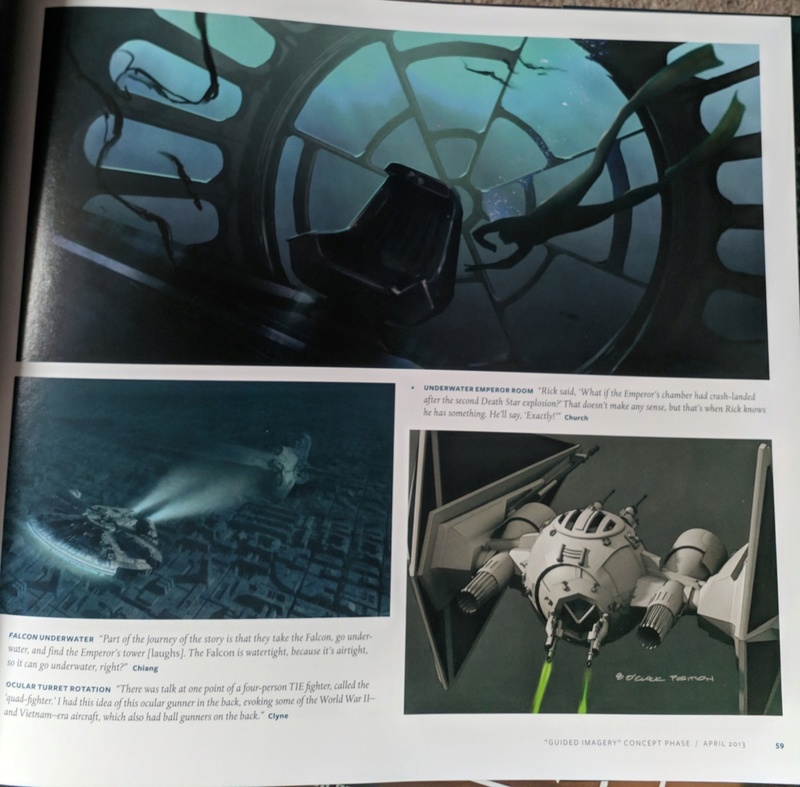 If you remember the Jedi books are full of astronomical treatises. Finally I add another meaning that is New Age. In the new age field "ascension" represents an avolutive growth, but if we go as far as its alchemical meaning, then the meaning becomes the possibility of accessing abilities present genetically in us, but not usable without a superior knowledge. The highest point of this ascent is the conscious achievement of other dimensions. 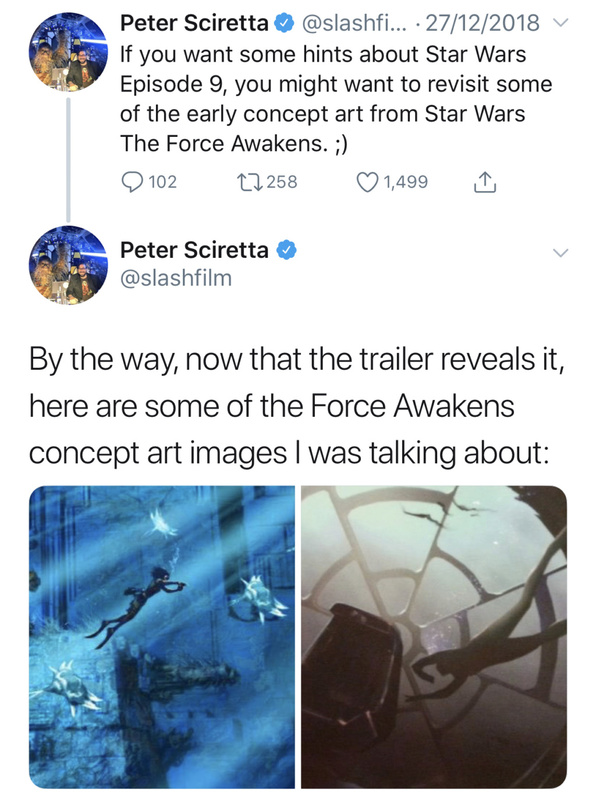 If related to this the fact that in the book of Thrawn, released in December, speaks of "Skywalker" as a term to indicate people -with Force precognition- who can cross the space - then, I think we are close to the trought. In essence, I think the word "Ascent" means all these 4 possibilities together. Therefore, in my hypothesis, Rey and Ben are the two navigators (the two Sky - warlkers) who have crossed ages and space to bring peace to the galaxy. The first Sky - walker Shimi , lost her memory. Always in my theory, taking inspiration from the Gnostic myth and from the Platonic man. The navigators - sky walkers - are created in pairs of opposites, and complementary ones like the Gnostic Aeons. Male and Female, intended to be completed. In my opinion Padmé was a navigator of the stars. 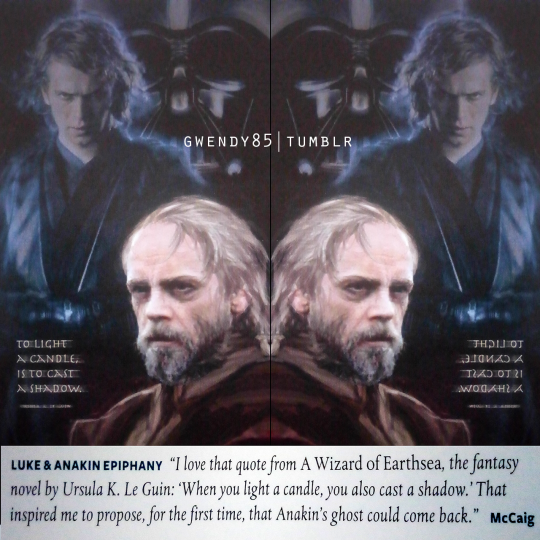 His opposite was Anakin who - born in human and mortal remains - to bring balance - together with Padme. Padme fails and decides to leave. In fact there is no explanation, she dies but does not die in childbirth and does not die because Anakin choked her. I have always thought that Padmé decides to die because, by now, his partner is lost in the dark side. He will be redeemed by his son and, as the Force is omniscient, and knows it, Padmè is resumed. Meanwhile Anakin has lost his way, the Force calls him two sons to help and Luke manages to restore the balance, but a secular enemy is always in sharp jeers. In the Gnostic myth it would be the demiurge. In this case it is called Palpatine. Be it a living being or a spirit. However, the spirit of absolute evil remains. The material evil. In gnosis, the two opposites are not wicked and corrupt, so the masculine represents the uncorrupted power and physical strength, its symbol is fire, as the feminine represents love and wisdom and its symbol is water . ONLY TOGETHER THEY ARE COMPLETE. Ben Solo is corrupted by the evil one (demiurge = whoever he is evil). In this hypothesis of mine, the Force sends Rey to the earthly world to help Ben Solo fulfill the prophecy of the predestined. If my hypothesis is true Rey is the platonic half of Ben, his half apple, and this is as true for her as for him. I expect Ben Solo to redeem himself by dying and as he completes his grandfather's task, the Force makes him come back to life as Ben Solo. Just a man: Ben. Only in this way, Rey would not be alone and his half "came back for her" - as promised. What do you think? Opinions? 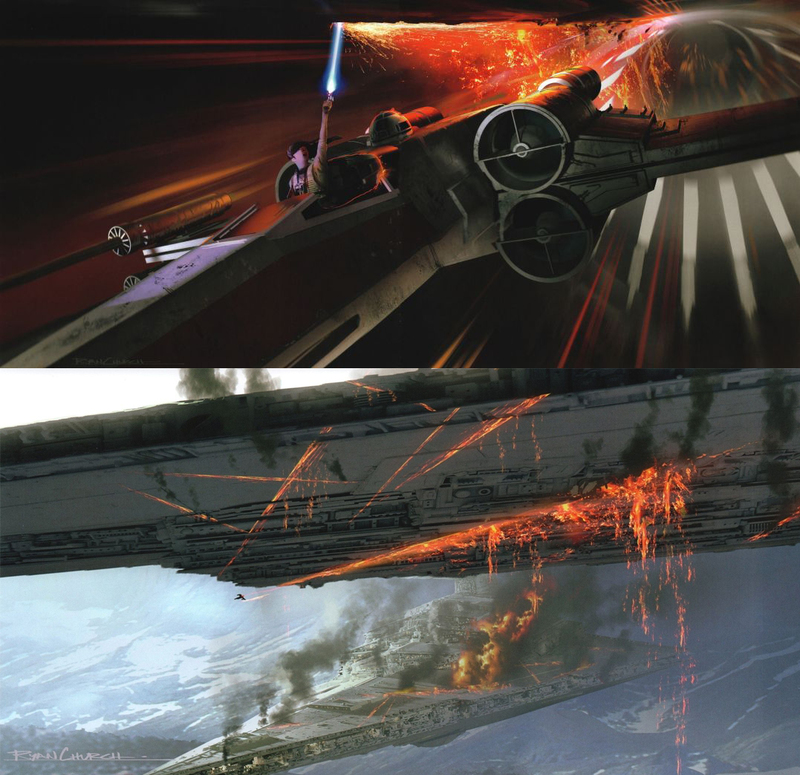 Now that I see the pictures, the parallelism between Kylo and Rey is so obvious (so obvious that I didn't even noticed after watching the teaser 4 times ). Do you think they are fighting or that it's a training (Kylo training Rey, finally) ? 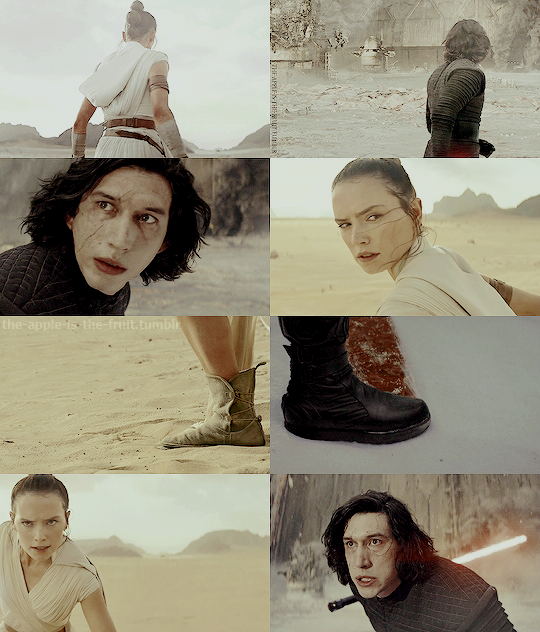 @Froggy wrote: Now that I see the pictures, the parallelism between Kylo and Rey is so obvious (so obvious that I didn't even noticed after watching the teaser 4 times ). When I watched the trailer for the first time I didn't have the impression they were fighting, but neither I had the impression they were training. I don't see the point in training that kind of move. But if it was a confrontation, Kylo would be shooting at her. From her face, I had the impression they were meeting (maybe for the first time) or they could be joining forces. I don't think is a confrontation, and it's obvious that the trailer want us to think they were fighting. I'm really curious. Exactly, now that I think more about all of this, the joining forces case is the one I can imagine for that scene. 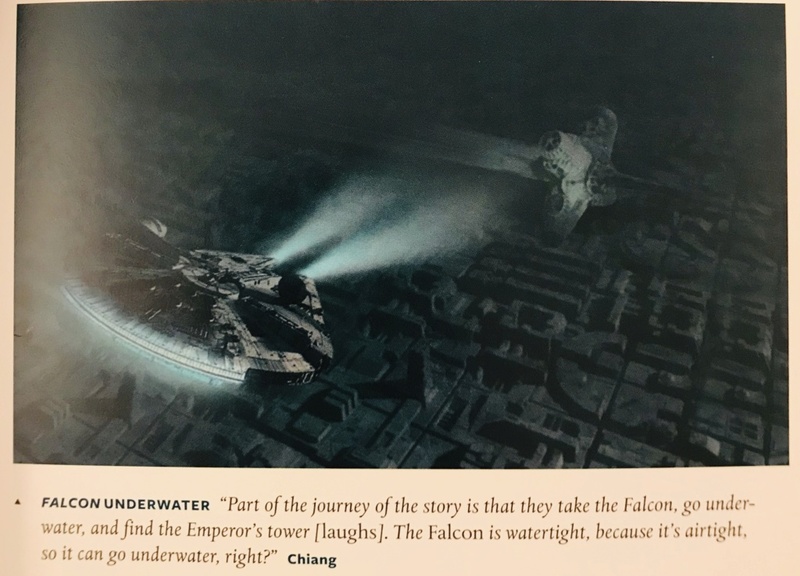 Maybe they just have a force connection and she is waiting him to pick her up to face some enemy, she did turn her back to the ship so she could land on the ship looking to the front with the lightsaber ignited, i don't know, maybe to deflect attacks the suppost enemies could throw at them? @giaciak2 wrote: Hi guys, I had an illumination. I love this! And I think all you mentioned was one of the influences for the Story Group and the directors of the ST LOVE!!!! OMG, thanks for answer. It took me two hours to write this horrible English and I thought I had written stupid things because nobody said anything. I have read now that you have this written in your account. "More than ever, the world needs Lucas and Star Wars's [sic] message of hope in the face of despair, the triumph of humanity over technology, spirit over matter, light dispelling the dark." Sometimes people don't say anything because what they have to say will not match the grandeur of what they read. I know I initially was hesitant to reply because I thought what I have to say is so minimal...so small, compared to how much you created and presented. But then I decided, "I must say something, even if it is small!" Plus, perhaps not a lot have seen what you composed. Thank you so much for the time invested!!! Adore all you composed, plus the research and knowledge...it's an amazing meta! I believe Bendemption and Reylo will happen, yet I will present a worse case scenario - if it does not, I will always treasure what Reylo and Bendemption have done for me. I consider myself aware of things and knowledgeable - appreciative of humanities (and a love of it), yet Reylo and Bendemption exploded the doors open with myth, literature, archetypes, philosophy..it's expanded my life because it's so rich. So, if it does not happen, that will never be taken from me..my life is enriched (plus 'meeting' incredible people...meeting in quotes because it's online. ). Therefore, Bendemption and Reylo happening in IX is cherry on top..and I am confident it WILL happen. I ‘liked’ as soon as I read it. I understood, appreciate and am encouraged by the 4 points you made. I am often on my phone chasing kids so it’s taken me this long to say that was a great post. I’m not amazing with words either although I devour pretty much every post. I feel I still I have much to learn from everyone despite hanging around for a while. As a biggest fan of Gnostic myth, I dig it so much! @SW_Heroine_Journey @MrsWindu @special_cases Hi REYLOS, Thank you for share yours opinions! Reylo heart is very big and full of HOPE! I love this idea and it could totally work ! Plus, if they're adding a new/old vilain to the movie it must be because Kylo/Ben is no longer a real threat. I still hope he won't redeem at the very beginning of the movie, I'd like to see more scenes where Rey and Ben are enemies and then slowy forgive each others or suddenly realize they just can't kill each others. Sometimes people don't say anything because what they have to say will not match the grandeur of what they read. No, I imagine he comes back physically. A man without strength anymore, except the love that, in the end, will be the true strength that has won all challenges. Hey guys, I have a question, with Palpy is back on the menu, does that mean Rey Palpatine/Rey is Palpy's granddaughter is possible too? @OrionStars wrote: Hey guys, I have a question, with Palpy is back on the menu, does that mean Rey Palpatine/Rey is Palpy's granddaughter is possible too? I don't know the answer, but this theory certainly got revived. That, and the theory that Palpatine created Rey with the Force, like Anakin.